Welcome to DrawingForAll, dear readers! 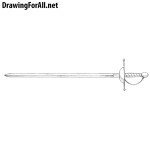 In this drawing tutorial we will show you how to draw a long sword. 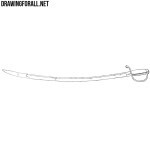 The long sword has an average length of 90cm, it is longer than short sword and shorter than greatsword. So let’s start! We start with a straight line. This line will make our sword of the most even and proportionate. 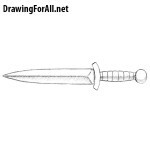 At the very end of the line draw a circle as a guide for a pommel. Proceed to the grip of the sword. 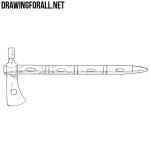 Draw the grip using in a shape of a cylinder. At the end of the grip draw the guard that can be straight or slightly curved as in our example. Draw the blade. The blade should be slightly wider than the handle and slowly taper closer to the tip. Erase the guideline that we have drawn in the first step and draw the fuller in the center of the blade. 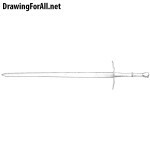 And at the last step of the lesson on how to draw a longsword add some shadows using light hatching. 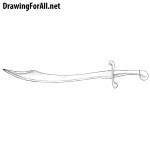 The long sword is the most common type of swords in the world, such swords owned by the knights and warriors of the ancient and medieval worlds. We hope this drawing lesson was interesting and informative for you. Don’t forget to share this lesson and subscribe to us in social networks.